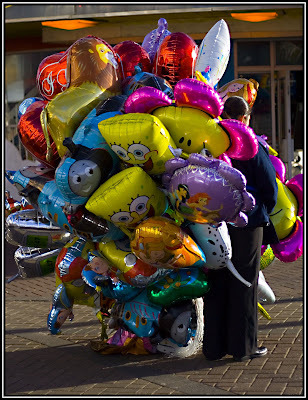 Firstly abject apologies and also thanks to all those lovely people who noticed that I hadn't updated my blog since Tuesday and wondered if I was Dead/Missing/abducted by aliens. I had a horrid week and thank goodness I have the most lovely gorgeous caring family or I don't think I would have made it to Sunday! The week culminated in a daytrip which was supposed to be to Fountains Abbey but due to some roadworks and a little fate brought us to the bright lights and gaudy colours of Blackpool. Blackpool is one on it's own really, for my US buddies, it's on the North west coast of England and is a mecca of amusement arcades, theme park rides and all that is traditional about the good old british seaside, there really isn't another place like it in the world, I love it for the occasional daytrip but I don't think I could afford to spend a week there!! In fact at the rate my children like putting money in tuppence machines I couldn't afford to spend more than a day there!! It was one heck of a day though, we arrived around two-ish in the afternoon which wasn't bad considering hubby had been to work in the morning. The kids quickly set about destroying as much of our finances in the quickest space of time and of course they loved every minute of it. I think the highlight of the day for all of us though was having a horse and carraige ride along the sea front all the way from the pleasure beach to Blackpool tower at the other end, if you want my unique veiw from the ride then check out my photograph of the day over at Don't Pose. We certainly did have fun yesterday and we didn't get home until 10pm last night, the children slept most of the way back and still managed to drag me out of bed at 7am this morning, for all the many talents my children possess, staying in bed and giving mum a rest isn't one of them!! 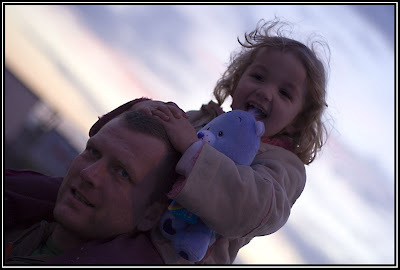 I'll leave you with one of my most favourite images of the day, Looby on Pauls shoulders just as dusk was falling, she had a wild old time although that poor Care Bear you see there got lost and to this moment we don't know quite where, lucky we won (for won read spent £50 trying to win!!) a couple of other soft toys along the way, Hubby even won me a Tigger cuddly, no one has won me a cuddly toy for years so I was chuffed to bits!! I really love my family, there may be only 5 of us but we have enough love for a whole planet between us, I am the luckiest girl in my universe!! Can you believe I have NEVER been to blackpool. Do you they still have those awful seaside shops full of gaudy gifts that were so typical when I used to go to the seaside in my youth. Oh I loved the saucy sweets and postcards. Love the photo's and now hot footing over to see the photo of the day.